The above is a quote from co-founder Felix Weth in an interview conducted by Chelsea Rustrum for Shareable. Fairmondo wants to create a scalable fair ecommerce platform and is one of the pioneering platform cooperatives with a innovative redistribution scheme that honours unpaid contributions. 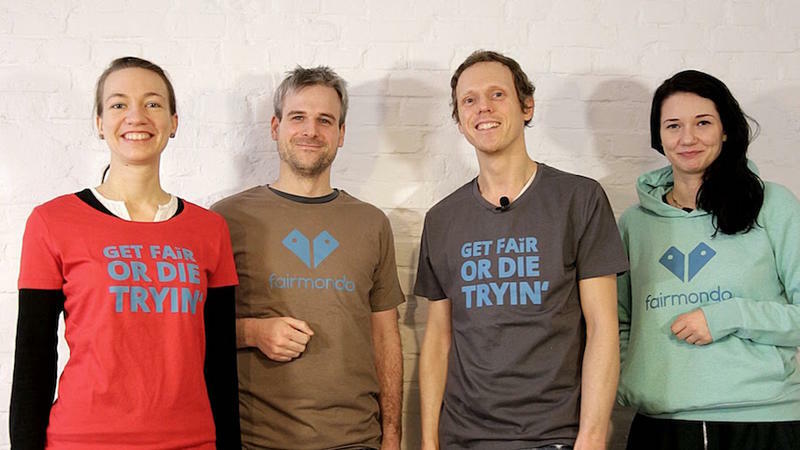 * Chelsea Rustrum: How did you originally fund Fairmondo and how are you sustaining it now? Did the crowdfunders automatically become members or was that a separate process? How does all of this work legally? * What is your business structure in Germany and what would it be in the U.S. if you localized here as well? Fairmondo is registered as a cooperative, according to German law. In order to preserve our vision even if the project grows big, we developed a set of principles and bylaws that we call “Cooperative 2.0”. They consist of seven core elements, which any new Fairmondo chapter needs to adapt. Among those are mechanisms to ensure democratic ownership and accountability, as well as an uncompromising commitment to transparency. Internally, local coops are largely free to adapt their preferred modes of operation. In Germany we are adapting a holacracy type of process. * What is your management model? There is no specific management model attached to Fairmondo’s coop 2.0 model. In accordance with German coop law, we have a managing board that is responsible (and liable) for running the company. Formally, this board takes decisions and is free to set up internal organizational processes. * How do you pay your employees? Do you feel they are adequately compensated or does that come once there is a surplus? As we have monthly presentations of our budget situation with the team, everybody was aware of this. The restructuring was then a quite difficult process in which we brought employees’ needs, business needs, and budget limitations into a balance that worked for us. Also, Fairmondo is supported by many volunteers (including the managing board), and some employees choose to work more time than they are paid for. In order to compensate for this, our Cooperative 2.0 model uses a special “Fair Founding Point” system. For every unpaid hour contributed to Fairmondo, members receive an equal number of 200 points. These points are registered in the bylaws and entitle those members to an extra share of the surplus once the cooperative works successfully enough to actually make one. * Can you please explain your four-pronged approach for distributing surplus? I want to start a discussion about using peer-to-peer lending to support smallholder farmers all over the world. I would like to incorporate Fairmondo’s concepts and approach in my business model. Why P2P lending for smallholder farmers? •	To give people like me a chance to make a real difference in the world while making a good return on our investments. •	Because P2P lending is the best investment opportunity the middle class has ever had. •	Because I believe trickle-down economics is destabilizing the world and I want to turn the tide. •	Because poverty is bad. •	Because small-holder farmers are hardworking people who just need the right tools to grow. •	Because I believe the technology exists and if we can just get a crowd behind it, we can make impact-first peer-to-peer lending a powerful force in bettering the world. Why use P2P lending to support small holder farmers in particular? I believe in bottom up economics. (The opposite of trickle-down economics.) Local entrepreneurs can develop local solutions to many of the world’s problems, but they need viable markets to grow their businesses in and markets are built on buyers, who have to have money to buy. Approximately 1.5 billion people around the world are smallholder farmers. They include 75% of the world’s poorest people but are also some of its hardest working. I believe that, despite the incredible growth and innovation in other industries, “agriculture remains the best opportunity for…smallholder households to escape poverty. Studies show that income growth generated by agriculture is up to four times more efficient in reducing poverty than growth in other sectors (Growth Commission, 2008).” By increasing the income generated and retained on small farms, we will not only help 75% of the world’s poorest escape poverty, but also help secure humanity’s future food supply, promote bio-diversity and encourage widespread economic growth. •	By building the buying power at the bottom of the pyramid, we will generate markets for local entrepreneurs. •	By increasing the retained income of farm families, we will promote education by enabling them to pay school fees. •	By increasing the retained income of farm families, we will promote health care by enabling them to pay health service fees. •	By connecting farm families with the knowledge and power of the internet, we will promote a new generation of global entrepreneurs. There are a lot of issues to consider in extending P2P lending to the world’s smallholder farmers and I would like to build a community of people interested in discussing them and brainstorming practical solutions for opening up this powerful new capital market. Please join the conversation by visiting https://www.causes.com/campaigns/100497-talk-about-impact-first-peer-to-peer-lending or emailing me at [email protected]. I look forward to hearing your thoughts and ideas! And please pass this along to any of your friends that might be interested.